Phenomenal! What else can be said about Bruce Dickinson that hasn't already been said? The man is a genius. From his time in Sampson to his legendary status with Iron Maiden and his excellent solo career, he has delivered the goods time and time again. And this two-disc set is no exception. The breadth of compositions on this record are staggering. The music is awesome and everywhere, whether it's whimsical ditties such as I'm In A Band With An Italian Drummer or Dickinson's rendition of blues track Ballad Of Mutt, or the wondrous and beautiful songs Darkness Be My Friendand Acoustic Song. This collection is worth having just for those two tracks alone. Darkness Be My Friend is one of the most moving and beautiful songs that I have heard in a long time. Did I just say beautiful? Dickinson's original rendition of Wicker Man, written and recorded several years before the Iron Maiden version, is a powerful and poignant song. 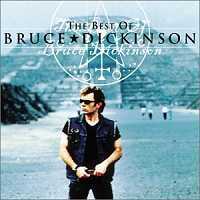 Whatever you have to do, go get a copy of the double-CD set, limited edition Best Of Bruce Dickinson before supplies run out. This collection is well worth the money and effort. My only complaint is that this 'Best Of' doesn't have the song Son Of A Gun from Dickinson's first solo record, Tattooed Millionaire. Oh well, maybe on the next one.